SOURCE: 2018 2rd Quarter: Bureau of Labor Statistics – 16 Years or Older & *2016 Census Bureau American Community Survey. 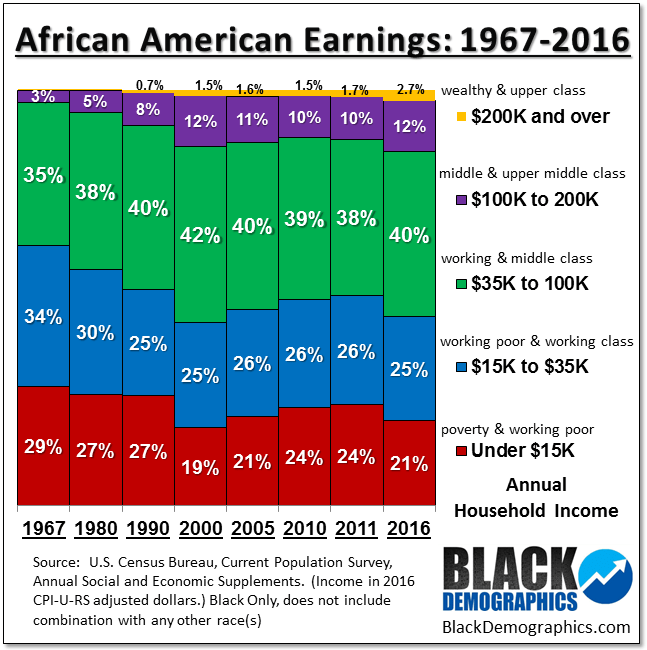 During the 1990s African American income grew tremendously. By 2000, 56% of African American households had an annual income of $35K or more compared to just 36% in 1969. However due to the Great Recession which lasted from December 2007 to June 2009 that number dropped to just 51% by 2010 reversing much of these gains. 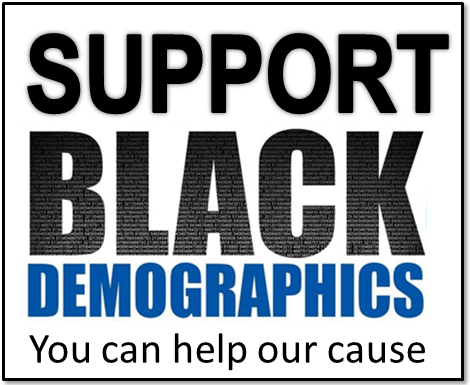 The most dramatic change during the Great Recession was the percentage of Black households making under $15K (from 19% in 2000 to 24% in 2010) which was well below the poverty line for families. 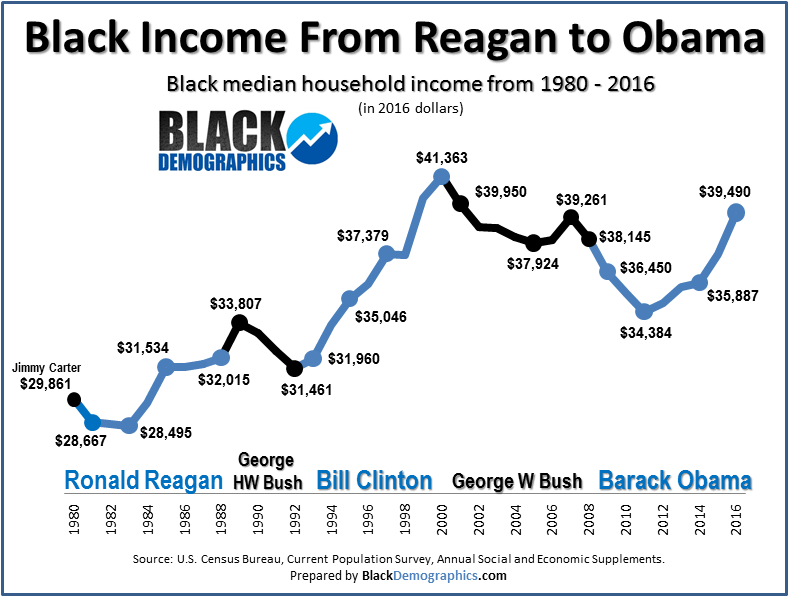 Although the economic rebound was slowest for the Black population, by 2016 Black median incomes nearly recovered and the Black upper class and wealthy grew to its biggest percentage ever. Although incomes for African Americans have improved significantly since the Civil Rights era, they are still lower than the national average. 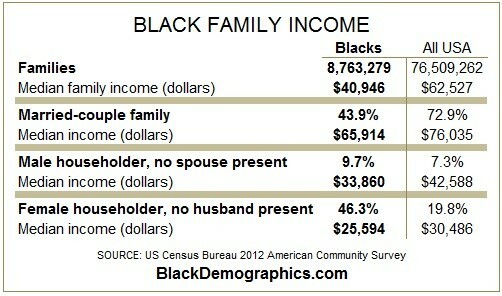 For example the median income for Black families is $20 thousand a year less than the national median income. 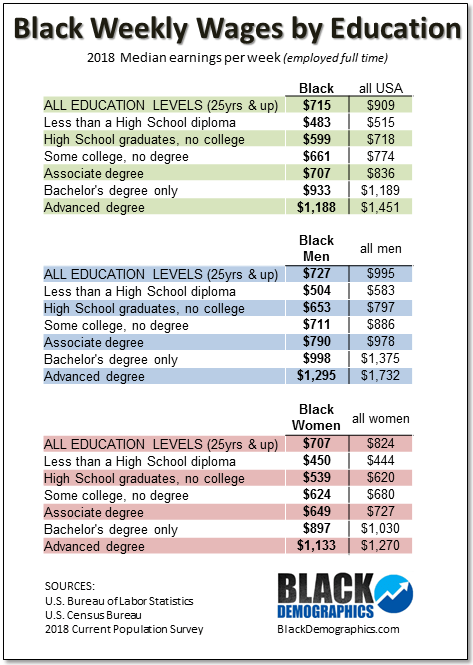 As you can see from the chart labeled Family Income 2010 that Black married-couple families make more than twice that of Female householder families. This charts also proves that there is a substantial benefit for those in a married-couple family regardless of race or ethnicity. 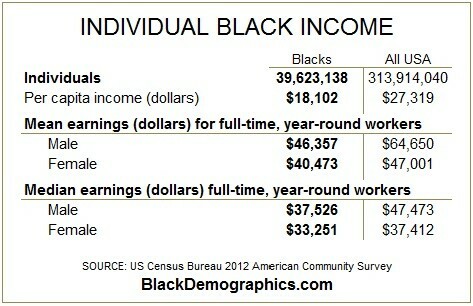 Income in the Black or African American Median Income may have decreased due to the increase in unemployment in 2010. Another indication is the correlation between education and wages. There are many educated African Americans in the work force, however, the numbers begin to lower from High School educated persons to Masters educated persons. There is less compensation overall among African Americans which, of course, affects the median income.